Asteroids and Meteors Oh My! As a writer of science fiction, I was rather amused by the media trying to get “science savvy” calling on “experts” to explain the events of the last day or so. The one theme that was consistent with all of the explanations was that the meteorite in Russia was not connected to DA14. One writer pulled out her “slide rule” and gave us a lesson in probabilities and statistics leaving us empirical evidence that the Russian meteorite was simply a coincidence. A small light show in the middle of the night, I would have bought as one can go out and watch the stars and on most any given night see a “falling star” or two. When we have an event like the one in Russia at the same time that we have a huge rock flying by earth at a mere 17,000 miles away; I find that hard to stomach that it is a “coincidence.” I was willing however to let it go as this is their field of expertise. Last night the 15th of February we had another event similar in nature happen over San Francisco. The reporter with a minor in math will most probably need to revisit her table of mantissa, as statistically speaking; the odds of these events having nothing to do with DA14, just went astronomical (pardon the pun). We need to look at how these rocks are formed in the first place. Exactly like this planet that we call home, they were first formed from “dust.” Static electricity is most likely the cause of the first clumping of dust until the clumps became large enough to have some sort of gravity, even micro gravity. In the scheme of things, speaking in an astronomical time frame, we have rocks, than we have larger rocks. Those rocks now have substantial gravity and they pull in even more “stuff” until they are the size of planets. Not all rocks make planets but because of gravity anything in orbit around another spatial body is in fact falling. The planet we are on is falling; as well as the other planets in our solar system. Because of the speed and the angle of our “fall” we are instead in orbit around the sun as the moon is in orbit around us. Rocks in space are falling as well. Many in fact are in an orbit between mars and Jupiter in the asteroid belt known as “the main belt.” Within this region of space reside many such rocks and even some dwarf planets. There is another belt called the Kuiper belt which Pluto resides in. These rocks and planets all have gravity and every now and then some event happens to cause one to fall or be knocked out of its orbit. As there is nothing to offer resistance to such a rock it does not take long to pick up quit a bit of velocity on its way toward the sun. My theory is that these rocks with their own gravity carry other smaller rocks with them that may very well have been in some sort of orbit around them. I think that is what we experienced this February. I believe that DA14 had some “friends” that it carried with it on its way towards the sun, and that is what came in to our atmosphere over Russia and San Francisco. There may have been more that hit us that we don’t know about. ¾ of our globe is uninhabited as it is covered with water. There is no stellar detection grid “yet” so we really have no idea if there were more or not. When statistics do not make sense, you need to look for another answer. There is an upside to this. If my theory is right, this gives credibility to the “tractor” scenario of adjusting the orbit of other spatial bodies. 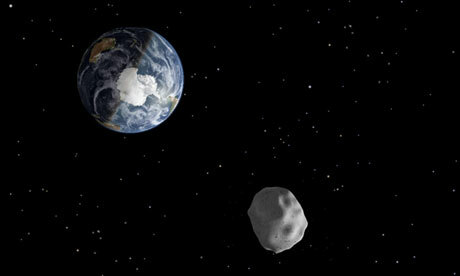 If those other rocks were indeed in orbit around or gravitationally attached to DA14, a moving larger rock, then we can and should proceed to figure out how to build such a tractor, and test it; as it is simply a matter of time when another life ending event such as the rock that killed the dinosaurs will happen again.